Labelled the It bag of the season, Chloé’s Faye soared to instant success after surfacing on the handbag scene. Fusing femininity with a contemporary edge, the Faye bag blends high-quality colored leather with standout hardware for signature cool-girl appeal. A bold ring and pendant chain, inspired by equestrian bridles, takes center stage on every silhouette, while stamped branding features subtly. Embody a 70s vibe with the Faye shoulder bag and use the tote for days in the city. Carry the clutch on nights out and look effortless with ease. Honestly, have you seen the original Faye Bag? Oh my, that’s a real gorgeous bag. You see, the Faye is designed with an oversized hoop in the center front; it’s also beautifully refined with shiny hardware. Then a hoop is linked with a chain to the side. 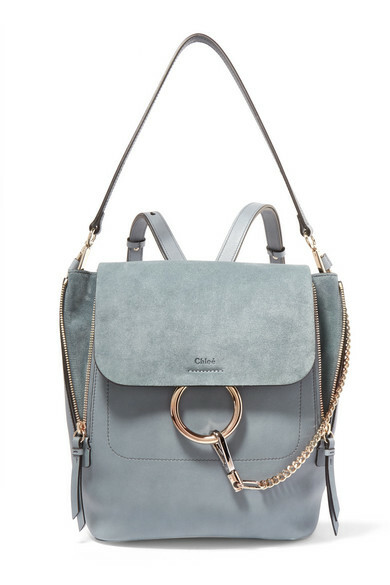 And now take a look at the Chlo Faye Backpack, the same-effect right?